THE SNP and Alec Salmond spent years courting Donald Trump to build golf courses and hotels in Scotland. Aberdeen council’s democratic decision to prohibit the destruction of the Meenie Estate for a Trump golf course was overruled by Salmond for the sake of 200 permanent jobs in his constituency. The award for sickening hypocrisy must surely go to Salmond and the SNP in their rush to now disassociate from Mr Trump. Mr Trump was a bigot, buffoon and a bully then and still is now the media spotlight falls on his antics in the American presidential campaign. The SNP courtship of Trump reflects poor judgement on their choice of associates, including such notables as Fred Goodwin and Rupert Murdoch. Mr Salmond was voted by the electorate to two full time constituency jobs, MSP and MP for Gordon and Banff. Simultaneously he has developed a burgeoning media career both on TV and a London radio phone in. Either it is perfectly possible to juggle two full time constituency jobs at Westminster and Holyrood together with media commitments, or the politician with only one full time constituency job is vastly overpaid. However, Mr Salmond is rarely seen at Holyrood, rarely attends Scottish parliament debates and has not made himself available for parliamentary committees. He elected not to attend the important Westminster debate about Syria and chose instead to unveil his portrait on the same day in Edinburgh. He said it was for charity, although parliamentary duties are a priority. THE Royal Mile pavements’ dropped kerbs are so steep that it will only take a split second’s lack of concentration on the part of a carer for a disabled person to end up out in the traffic at, say, the North Bridge/South Bridge junction. If the disabled person ended up being killed, the coroner would describe it as a tragic accident. 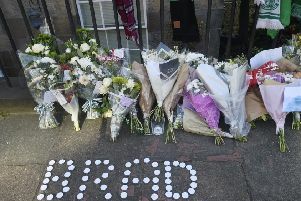 But I have told the City of Edinbrugh Council how dangerous the crossings on the Royal Mile are, including at George IV Bridge/Bank Street and Jeffrey Street/St Mary Street. I have asked the council to raise the roads rather than drop the pavements but nothing has been done to these crossings. I have other problems such as at Abbeyhill. The pavements are so bad my electric wheelchair broke and the police had to be called to get me the yards back home. A MAJOR problem facing people in Edinburgh is how to dispose of or recycle large, unwanted household items. The absence of a council-run free collection service as part of normal recycling leads to serious issues of dumping. The existing council scheme of making a £21 charge to collect up to six items is unbelievable in its lack of understanding of people’s ability to pay or how to tackle the problem of disposal if they cannot. The City of Edinburgh Council must immediately start a free collection service for unwanted household items. This will not only benefit its citizens but protect the reputation of Edinburgh as a city worth visiting. THE campaign to save Edinburgh’s fire museum is gaining support from politicians amid warnings that plans to relocate to the outskirts of the city would mean a dramatic drop in visitor numbers. The iconic fire station is likely to be moved from its current home at the old central fire station in Lauriston Place to the new east division headquarters at Newbridge. I sincerely hope these plans do not come to pass. The museum has been part of Edinburgh’s history and heritage for many years and should be left where it is. I TOOK a British Airways flight this month from Edinburgh airport. No jetbridge was used and instead, passengers had to wait on the Tarmac and then an uncovered stairway to board the plane in the rain. The airport is failing to provide even the basic service one would expect from a proper airport. It ought to focus on this, not stuffing its terminal full of expensive shops. AS an ex-member of Portobello Swimming Club, I feel that more recognition should be given to two outstanding members, Peter Heatley and Ned Barnie, for their international achievements over the years. We welcome letters by post or e-mail, but we do not publish letters where only an e-mail address is supplied. Please include name and full postal address, a reference to any article and a daytime phone number.